"The reason to paint any picture is to share my feelings about life itself. When I paint I tell the viewer what I like, what I believe, and what I'm concerned about." Heather was born and raised in Toronto, Canada. As she grew older she explored parts of Europe, Israel, Japan, the United States and across Canada. She has worked in the Canadian Rockies, northern Saskatchewan, the Northwest Territories and Ontario. She has a degree in Fine Arts and Geography from the University of Waterloo, and a diploma in Cartography from Seneca College. A career in Cartography provided a way to combine both her loves of art and geography. 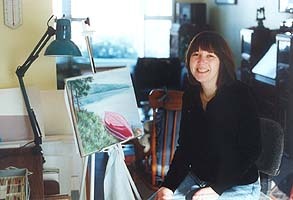 Mingled with her career as a Cartographer she also gained experience in graphic arts and illustration. She has taken art workshops at such places as Cedar Ridge Art Center, The Royal Ontario Museum, Buckhorn School of Fine Art, and the Newmarket School of Fine Art. She studies with accomplished artists such as Sergey Malina, Terry Andrews and Martin Price. In 1992 Heather was diagnosed with Multiple Sclerosis. Since then she has turned her sights completely to her art career and is now a full time artist, portraying her love for the land, it's animals and nature through her works. She has participated in a variety of juried and non-juried shows, including The Toronto Outdoor Exhibition, The Newmarket Intercultural Exhibit, The Stephen Leacock Gallery, The Link Art Gallery, Art Aurora, The Society of York Region Artists shows, The Markham Art Show, The Manse Gallery in Muskoka, as well as solo shows at the Markham Theatre and elsewhere. She has received awards for her works and her paintings hang in many private and corporate collections across Canada, the United States and Europe, including The Bowman Collection at the Newmarket Public Library. Heather is pleased to announce that, since displaying samples of her work on her Internet web page, she has sold publication rights for her painting "Outlook" to McGraw-Hill Ryerson press for their year 2000 textbook catalogues. Heathers love for animals has led her to start Pet Love Originals, a new business for the creation of commissioned original pet portraits as well as landscapes. Having worked with pen & inks, acrylics and watercolour, Heather now primarily works in pastels. Heather teaches both private and semi-private adult classes in her home studio near Penetang and Midland, Ontario. Part of Heathers philosophy as an art teacher is that art should be a fun and enjoyable experience. A form of meditative relaxation that allows freedom and self-expression.